TODAY’S BREW: This Columbian Something or Other that benefits Save The Children. BECAUSE I AM SO KIND. I LIED! This post isn’t really by me, because today is FLASH FICTION FRIDAY!! And true to our roots, we have a vampire story for you, by the wonderful Tammy Farrell. We’re fans of Tammy’s on Twitter (follow her @TamzWrite), and we’re both really excited for her novel THE DARKNESS OF LIGHT to come out on January 28th!! I mean, LOOK AT THIS COVER. YAAAAAAY! 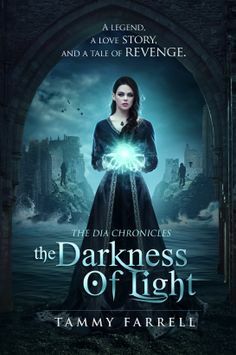 (Trust me, add her on Goodreads here https://www.goodreads.com/book/show/18628472-the-darkness-of-light). For now, enjoy her short story, Bones! The scent of lilacs and orchids swept over me, but it wasn’t from her hair anymore. That surely faded some time ago. Now the aroma came from the vibrant bouquet atop her headstone, mixed with the musty odor of damp soil and a rotting corpse. I dug deeper, using all of my immortal strength to reach the coffin. The dead were a definite six feet under in those days, sure to keep the plague from rising up. My dark trousers and white cotton shirt were torn and filthy from my frenzied digging. There wasn’t much time left before dawn. I swept a strand of black hair from my face, completely unaware of the wretched monster I’d become. What did it matter? No one was around to see me, not at that hour. Two years had passed since I last saw Clara’s angelic face. She was the picture of innocence at 17, and from the first moment I saw her, I knew I wanted her. The last night of her life, was the first night I went to her. There was no need to glamour her then, for my alabaster skin and fair brown eyes were mesmerizing enough. She made no sound when I entered her room, and she watched me with large blue eyes as I closed in on her, stepping to the rhythm of her mortal heart. I wanted her. I wanted her blood, and I wanted her spirit. She smiled—even in the face of a night demon—she smiled. I ran my fingers through her precious golden hair, and her perfume coiled through the air until it was all around me. Then I cupped my hand on her warm cheek, and with my sharp thumb-nail, I grazed the smooth texture of her skin. She let me wrap my arms around her as I leaned in to bite. She was to be mine. Soon I would not only taste her sweet blood, but give it back to her and make her my immortal companion. When I pierced her flesh she gasped, and I drew at the pulsing life that flowed over my tongue like a thick, delectable syrup. While it coursed through my veins I became entranced by the heavenly light that came with her blood. I was lost in her. When I finally pulled away it took several seconds before the light faded from my eyes and I was able to see my princess. She was limp on the bed, her eyes were open in a vacant stare and the swell of her bosom no longer rose and fell with each breath. I waited for her to move, but her arms hung at her sides like a fallen branches. The next week I visited her grave, anguished at my ravenous attempt to make her mine, but instead, like a fool, I took her life. I watched the freshly dug mound as if she might break through at any moment, but all was silent. Even the little bell attached to her headstone, used by those who had been buried alive, was still with death. “My darling,” I sobbed into the ground. I was certain I was alone, but my moment of anguish was soon interrupted when I heard a gentle whisper in my ear. “William. William,” it said in a voice like a thousand ringing bells. I perked my ears as the voice called to me. I waited for her ghost to appear before me, to see her face once more, but the night was unmoved and I cursed the God that would send a formless spirit to haunt me. The following evening I was awoken, not from my nightly hunger, but from the echoing chant of my bodiless bride. This was the first of many nights that her presence would stalk me. Even as I wandered the streets, she would speak for my ears alone, and anyone in my company would retreat from my constant bickering with the air. When I hunted, she spoke to me, spoiling the comfort I might find in the blood of my prey. She was vicious and relentless and would give me no peace. I endured two years of this torment and no amount of pleading or prayer would drive her away. When I found myself back at the cemetery I was desperate, and resolved to unearth her. It was then I noticed the silence. I dug faster. Finally, when the sharp blade of my fingernail scraped the surface of her coffin, I almost expected her to scream from within. And when I punctured the lid with my clenched fist, her voice remained unheard. Only the crickets and night owls kept me company. Through the jagged whole of the lid I saw her skull. The large black holes where her beautiful eyes once rested looked up at me, and the wide, toothy grin seemed to mock me. I lifted her out, thinking the skeleton might come to life, but it did not. Her body of bones was clothed in a white lace dress that had begun to yellow, and I laughed at the irony of it. Here was my bride of bones, dressed in her wedding gown. Her remains crackled when I gathered them into my arms and for the first time in two years, I knew peace. My strides were long and steady as I made my way out of the cemetery, cradling the dress and bones close to my chest. I now had my bride, and her voice was finally hushed. That night I went to sleep for the day as I have every day since then, with my bride of bones tucked close by my side. A small price to pay, I suppose, for my peace of mind. http://tammyfarrell.com/the-writing-life/ Main web page is tammyfarrell.com.